Jamie is wearing his father’s coat again. Unlike when he donned it in season one, now he’s matured enough to wear it. The last episode showed that he was embracing leadership; in “Je Suis Prest” there is no doubt that Lord Broch Tuarach is in charge. The Frasers have reunited with Murtagh, Fergus and the Lallybroch men, bringing the men Lord Lovat supplied. The numbers have dwindled along the way, so Jamie sent Young Simon back to try to sweet-talk the reluctant, dangling a carrot of land after the war - assuming they survive to claim it. The remaining men are hardly soldiers, but Murtagh is determined to change that - he’s the quintessential terrifying boot-camp drill sergeant: trying to train them to face forward or turn, depending which bagpipes song is playing (yeah, it all sounded the same to me too). Unfortunately the men - most having never held a real weapon, let alone fought in a proper battle - are not the best students. Jamie and Murtagh not only have Claire’s knowledge of the future, but were once trained as soldiers by the French, so they know exactly what it will take to face the British army. Jamie wants his men ready - physically and mentally - before he takes them to join the Prince. Frustrated at their attitude, Jamie gives them a pep talk, and he’s really getting through - that is, until Dougal ruins it. 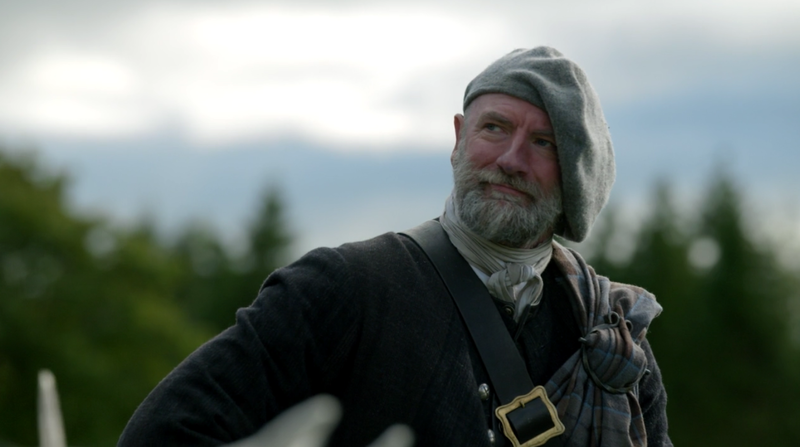 Yep, Dougal is back, striking out on his own (well, with Rupert and Angus) to join the cause now that Colum has officially made Clan MacKenzie ‘neutral’. Although still throwing thinly veiled condescension towards Jamie, Dougal’s smart enough to know he’s better off meeting the Prince as part of Clan Fraser than alone. So he outwardly accepts playing second fiddle to Jamie’s leadership, even eagerly doing his part to help train the men (albeit with rather violent close combat techniques). I think he might be just a little bit proud of Jamie (but would never admit it!) Nevertheless, Dougal continues trying to undermine his nephew at every turn. He thinks they just need to hurry up and get on with it; Dougal’s idea of going into battle is the Highlander Charge: running in half-naked while screaming like banshees. But Jamie sees right through his uncle’s machinations and tells him to shape up or ship out, so Dougal tries to get Claire on his side instead. Bad idea. Claire ends up giving him an earful worthy of any soldier, and sends Dougal on his way. I do think he was telling the truth when he said that Scotland and the Jacobite’s cause mean more to him than anything else. He is indeed selfish and egotistic - but he really believes he’s doing the right thing. Unfortunately for him, Claire not only has zero trust in anything Dougal says, but she’s dealing with her own demons. Claire is showing all the symptoms of PTSD. Anyway, Jamie’s trying to turn farmers into soldiers; keep a lid on his rogue uncle; and ‘be there’ for his wife. He’s got guards who can’t grasp the concept of not letting strangers into the camp - so the first time that happens he orders the guards to be lashed...a punishment we know Jamie doesn’t take lightly. The second time, Jamie takes the punishment himself. In doing so - and exposing his scarred back - Jamie further earns the respect of his men. The second stranger to infiltrate the camp - a young British lad named William Gray - recognised Jamie as “Red Jamie, the Unprincipled and Traitorous Rebel”. Jamie plays the part to the hilt to elicit information, but he isn’t getting far until Claire joins the Fraser acting troupe. The two make Gray think “sadist” Jamie is going to “ravish” his English prisoner Claire. I wonder why Claire wasn’t “triggered” by seeing Jamie threaten torture to a young soldier, when just about everything else had set her off. I seriously hope that, having broached the PTSD subject, the show doesn’t just forget about it. Gray confesses, Jamie allows him to live [not that he really had any intention of killing him], and the boy says he’s forever in Jamie’s debt. [Foreshadowing, anyone?] Armed with new information, Jamie conducts a triumphant “commando raid” on the British camp, rendering their cannons useless by destroying all the wheels. And with that, it’s time to go. After giving Dougal the honour of announcing their arrival to the Prince, James Alexander Malcolm MacKenzie Fraser leads his Clan to join the Jacobite army. Je Suis Prest.